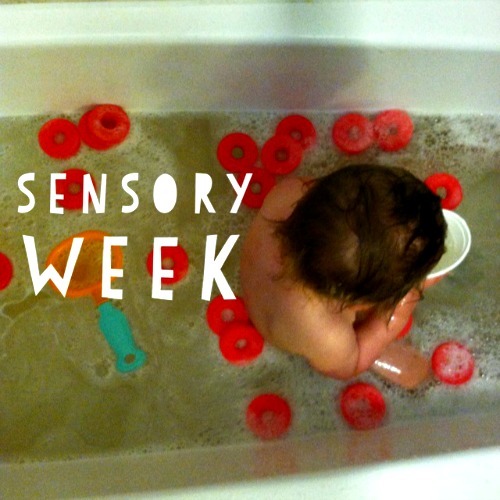 Sensory Week was definitely my favorite so far. 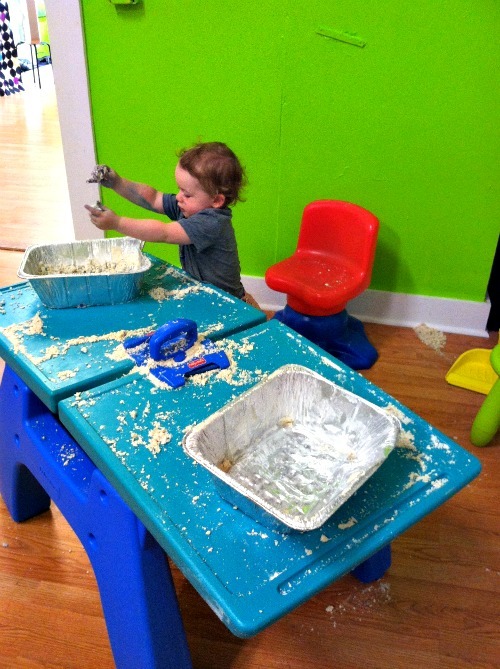 Basically we got to do something fun and messy every day, and Milo really loved the play time. In looking ahead to next summer, I'm not sure that we'll do something quite so structured, but I'll definitely have some of these activities on repeat weekly. 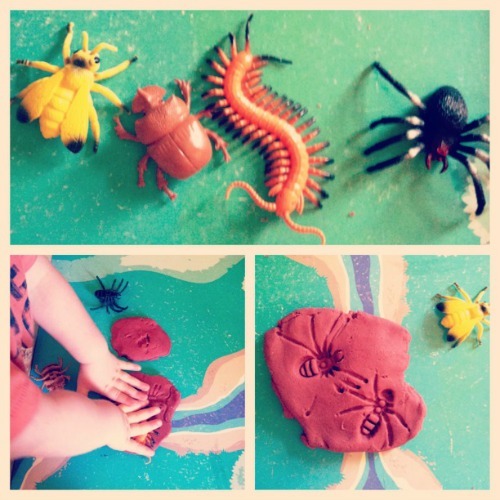 Bug Fossils in Play dough: I had some rubber bugs from the party section of Target and we smushed them into chunks of play dough. It was awesome because they had the perfect amount of detail to look really cool when you peeled them away. We used the words SQUISH and PRESS. 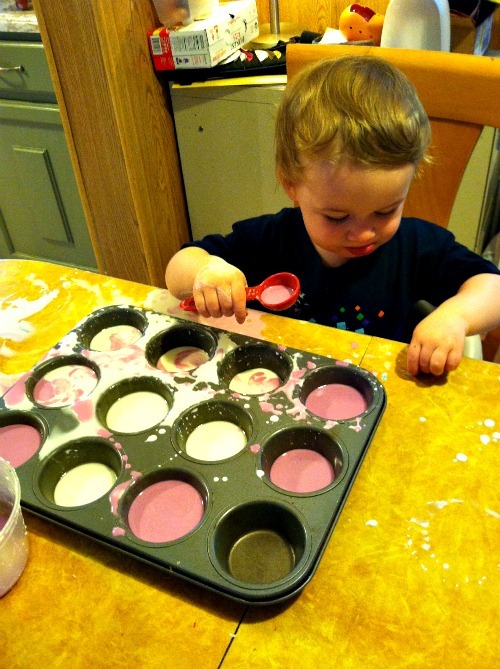 Ooblech Transfer: Our ooblech came out way too runny, and I would have liked to have different colors in different muffin tins, so I know what I want to try next time. Still, Milo LOVED moving the ooblech from one tin to another, and rubbing it all over the table and himself to watch it dry. Rice Bin Disaster: I took the rice bin back out a few times this week. Here is the aftermath of leaving in unattended for only about 3 minutes. Milo went insane when he could actually climb in the rice bin and play. It was worth the mess, but it's been relegated to an outdoors toy. Shaving Cream Exploration: This was really fun. 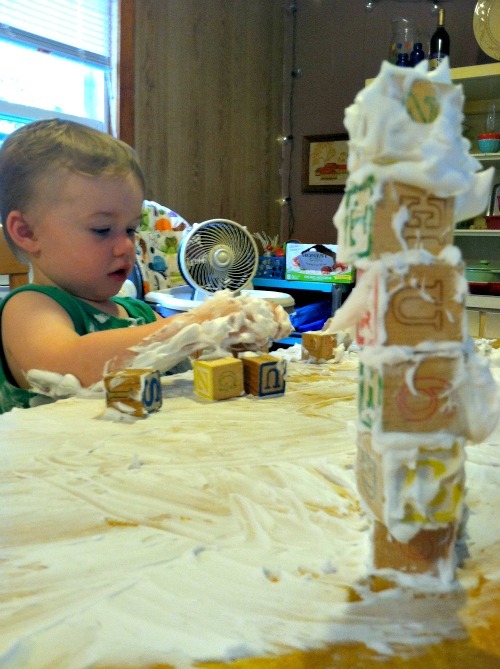 Even my first graders love to go crazy with shaving cream, so I knew Milo would like it, but my favorite part was using it like cement to make some awesome block towers. Everything smelled like a barbershop but it kept Milo from thinking this was whipped cream and he didn't attempt any tastes. Next time I might add a drop of color or start the cream out inside a container and see how he spreads it out. Gross Motor Obstacle Course: I was so proud of myself, coming up with a cool obstacle course that got us outdoors and using the whole body. 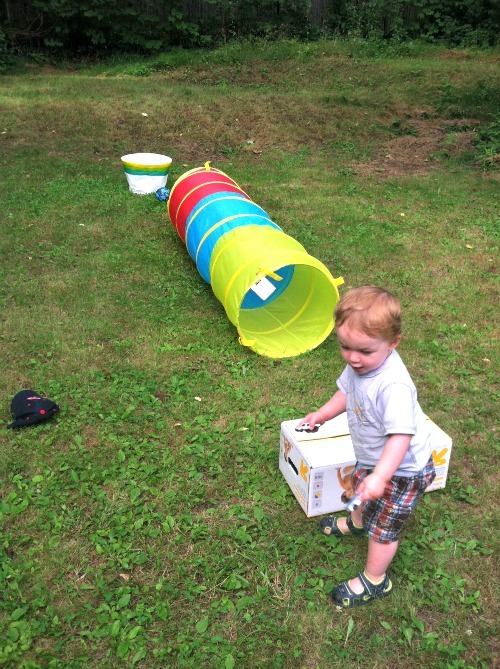 It was toddler-simple: over the box (you get to jump on the box! ), through the tunnel (you love this tunnel! ), and throw the ball into the bucket a the end (you throw balls in the house all the time!). I showed him twice, but Milo was not having it. He wouldn't try it even once. Don't let my genius go to waste- try it at your house today. Elliott got into the act this week, too. 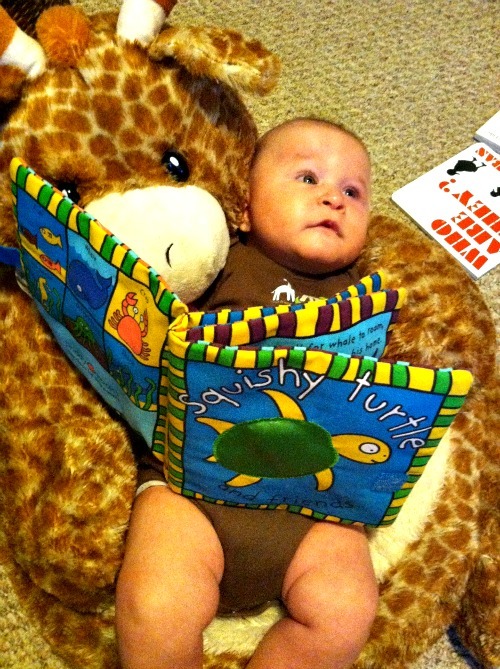 We have a few cloth books with tons of sensory input on each page- cellophane sewn into pages, ribbon and silk pulls, mirrors, buttons, and squeekers. You can buy these at Barnes and Noble or Amazon, and more talented mamas probably make custom ones that would blow your mind. I also made him a "play tent" when I felt guilty for needing him to chill in his pack and play one morning. 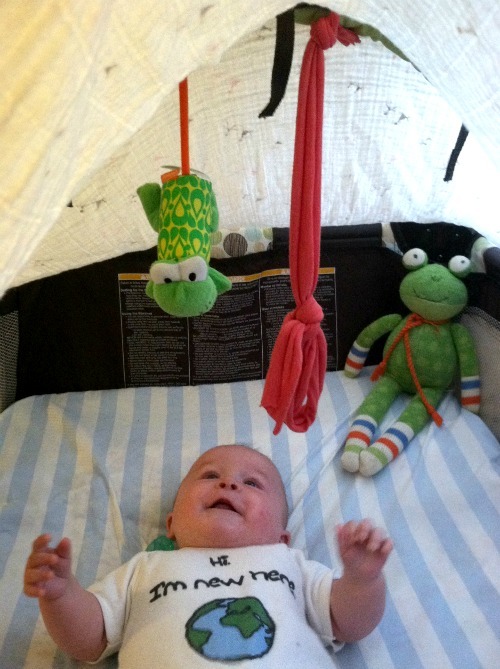 A few different dangly toys for interest, and a large muslin blanket thrown over the bar to diffuse the light. He kicked like crazy, which is his way of saying, "I love this, you're awesome, Mama." For our field trip, we went to the Modern Edge Art Bar in Fitchburg. Saturday mornings they have a toddler sensory art class, so some great friends watched Elliott while Milo and I checked it out. It cost ten dollars and there were cool sensory tables set up for free play. A lot we had seen this week already- shaving cream, a big rice bin (their rice was multicolored, which I liked), play dough...but they also had moon sand, which I had never seen or felt. 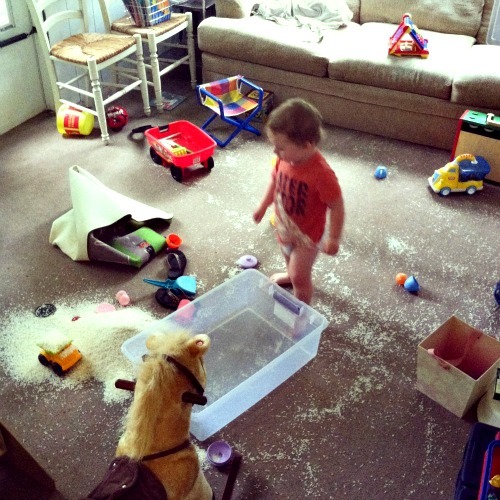 It was cornstarch and baby oil, which made the wood floor slippery (and fun!) The walls also had big areas of chalkboard, magnetic boards with geometric magnetic shapes, and a felt board. The biggest draw was that you didn't have to clean up the mess. Milo had fun, chatted with a few different kids, and got SO DIRTY, which was endearing to me in an environment that I didn't have to mop. We rocked it during sensory week.